The last snows are melting fast on the mountain tops, and everyone is busy cleaning for the Easter visit by the parish priest to bless their homes and families. After a mild winter, once again it's spring and time for another Marche Voyager newsletter..
One of the Marche's classic Lenten dishes is humble salt cod, or baccalà, from the cold grey waters of the North Sea, and it's a fixed feature on the meat-free menu traditionally shared on Good Friday. The use of baccalà goes back to early Medieval times in Italy, and it was once one of the most important commodities traded between the Mediterranean and Scandinavia, often in exchange for salt. One of the most popular recipes is Baccalà al forno, simply roasted with tomatoes and onions on a bed of potatoes - you'll find plenty of recipes for it online. Ice cream in Italy is a two-billion Euro business which employs some 40,000 people. The prestigious Italian food and wine magazine Gambero Rosso produces an annual Gelaterie d'Italia guide and awards the finest ice cream producers a tre coni, or "three cones" rating, one of which has been given this year to a gelateria in the Marche: Paolo Brunelli at Senigallia. We've mentioned before the use of onions at Urbania to foretell the coming year's weather. It's a tradition said to date back to Medieval times, and the knack is currently guarded by Emanuela Forlini, a local teacher who inherited the skill from her father and grandfather. This year signora Forlini's onions suggest we're in for a long and fine summer without excessive heat, following a somewhat late spring. Fingers crossed! 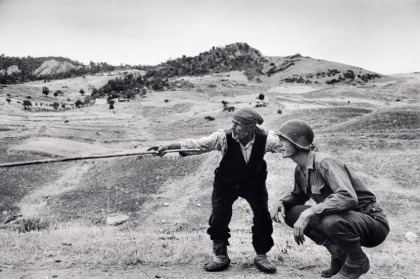 Two interesting exhibitions to head for this summer in the Marche: a major exhibition of images by the legendary photojournalist Robert Capa takes places at Ancona's Mole Vanvitelliana until 2 June 2019. Capa, who died in 1954, was one of the founders of the celebrated Magnum Photos agency and the show features more than 100 black & white photographs documenting the major conflicts of the early-mid 20th century. Meanwhile, Titian's famous portrait, normally on show at Florence's Uffizi Galleries, of Francesco Maria I Della Rovere (detail below) forms the centrepiece in an exhibition at Urbania's Palazzo Ducale from 13 April to 14 July 2019. 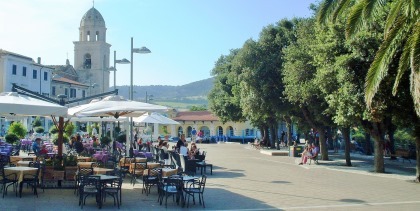 A summery scene with palm trees in the central Piazza Vittorio Veneto in Sirolo, the popular seaside resort perched on the flanks of Monte Conero. Just a reminder that this spring sees a succession of public holidays in Italy - on 22 April (Easter Monday), 25 April, 1 May and 2 June shops and businesses are closed, although most museums, restaurants and bars will be open. We mentioned it in the last newsletter, but it's worth repeating: if you're British and live or own property in the Marche, you'll be concerned about the future with Brexit getting ever-closer (or not!). The campaigning group British in Italy is seeking to protect the existing rights of British people living and working here, and their website and Facebook page are useful resources for news about how Brexit may affect you. British in Italy website. And Facebook page. The population of the Marche is 1,531,753, which is just 2.5% of the population of Italy.